Jac-Riser aircraft fueling hose is a flexible connector hose ideal for aviation fuel supplied through an adjustable elevated aircraft service platform, called a Jac-Riser, which is connected to a mobile dispenser cart supplied by an in-ground hydrant system. 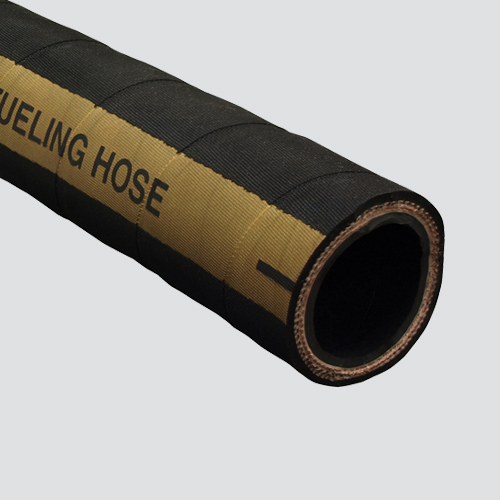 The hose construction and materials provide a path for static electrical charge to ground for safety, and the dual wire helix provides flexibility, kink resistance, and full suction capability for both fueling and defueling/unloading service. The premium nitrile tube will not contaminate product going through the hose, and the nitrile cover is resistant to abrasion, oil, and weathering. Meets industry standards API/IP 1529, NFPA 407, and BS EN 1361.